Osso buco means a bone (osso) with the hole (buco) still in it. It's the slice of the veal shank with the center bone. I use some of the marrow from the bone to prepare the risotto, as it brings all the flavors together. But you’ll want to make sure there's plenty of marrow left for your friends, because it is an uncommon treat. Talk with your favorite butcher about it — this is where you want someone to select the best cuts for you. (And why don't you bring this butcher a bottle of his or her favorite wine at the holidays?) It’s all part of the wonderful art of friendship around food, an Italian specialty. In a heavy Dutch oven (with a lid), melt the butter and lightly brown the vegetables. Remove from the heat and set aside. Mix together enough of the salt, pepper, and flour to form a mixture for dredging the veal. Evenly coat the veal shanks in the seasoned flour and shake off any excess flour. Set aside. Heat the olive oil in another deep, heavy pan until hot and sizzling, then brown the dredged veal pieces in batches, making sure the heat stays even. Don’t crowd the meat, and try to brown it evenly. When browned, transfer the meat back to the Dutch oven, standing the shanks up snugly on top of the vegetables. Pour the wine into the same pan used to brown the meat and deglaze the pan, scraping up all the tasty bits of meat. Boil briskly until the liquid is reduced. Stir in the chicken stock, tomatoes, and herbs. Bring back to a boil. 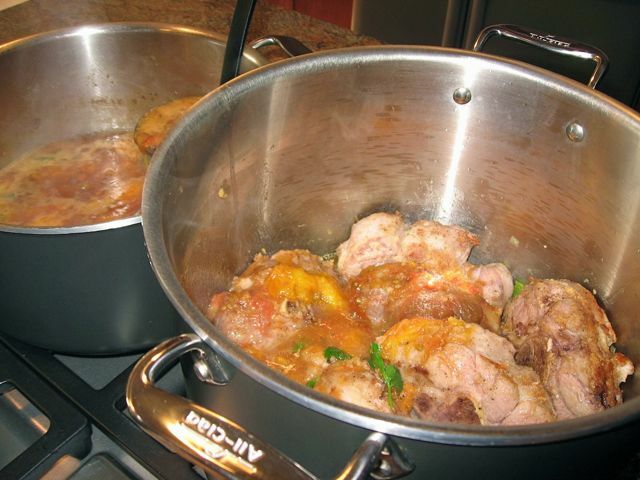 Pour the chicken-tomato liquid over the veal until the veal is at least halfway covered; add more stock if necessary. Bring it to a slow boil on top of the stove, then move the Dutch oven to the lower third of the oven to bake. Keep simmering gently for at least an hour and a half. Serve the meat on top of the vegetables with freshly made gremolata sprinkled over all, with additional gremolata to pass at the table. It's just fine to use canned whole tomatoes for this recipe. I like to use the frozen tomatoes I have put up from the summer, which are already skinned and ready for sauce. For the lemon-themed dinner, I used half yellow Brandywine tomatoes, which gave the sauce a beautiful, lighter yellow color. It is fine to prepare this dish ahead of time, cool, and refrigerate it overnight, then reheat it slowly during the hour before your guests arrive. The meat will be incredibly tender and falling off the bone, and the flavors will be even better integrated.